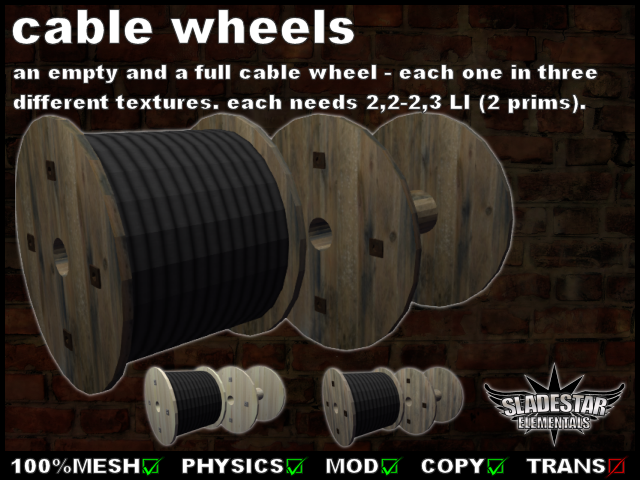 you get 2 types of cable wheel – full and empty. you get 3 versions with different textures. i made them 100% mesh. you get them mod to resize or copy to rezz as much as wanted. each needs 2 prims. 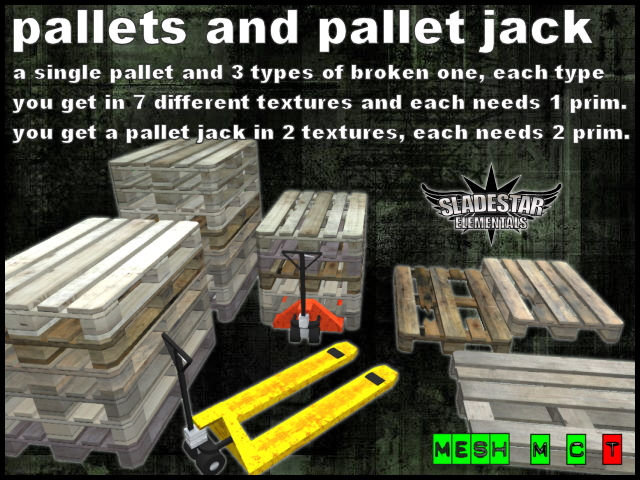 now you can get a big pallet package to decorate your grunge or urban styled area. this package includes a single pallet and 3 types of broken one. each of this 4 pallets comes in 7 different textures. each pallet only needs one prim. additional you get a rusty pallet jack in red and yellow. each pallet jack only needs two prims. all you get in this package is mod to resize and copy to get as much as you need. all in this pallet package is 100% mesh made. here you can buy a crates bigpack. i created 6 different fullmesh crates, each one you get with 6 different textures – it means, that you get 36 different crates. 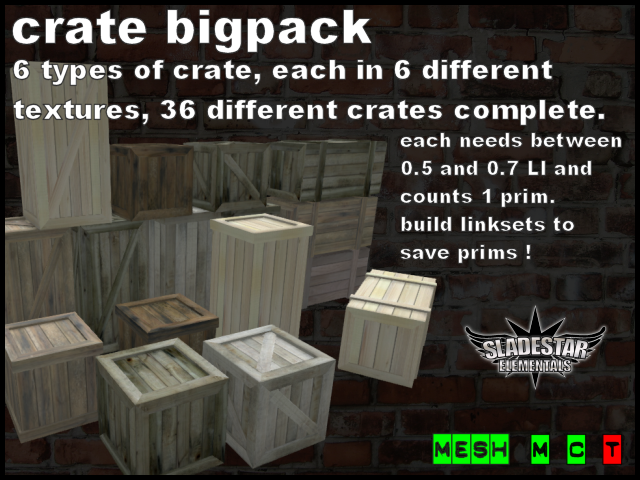 each crate needs between 0.5 and 0.7 LandImpact – and counts as 1 prim. Link them together to save prims, a complete set of 6 crates only need 3 prims within a link-set. you can modify the crates to change size and they are full copy to get as much crates as you need. 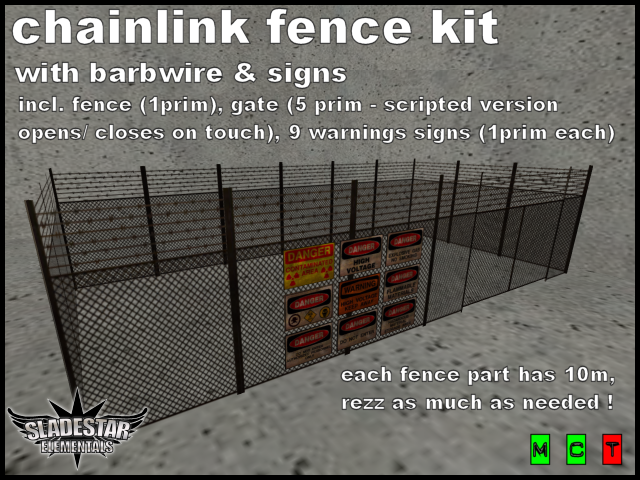 Now you can make the dangerous areas save for your visitors: use the chainlink fence – kit with barbwire & 9 different warning – signs ! It’s an old, rusty & dirty chainlink fence with barbwire at the top – perfect for urban, wasteland or apocalyptic areas. Each item in this kit is copy – so you can rezz as much parts as you need for your area. Each fence part is 10m long, so it is easy to build up. The prims are modify, too (scripts not). Any questions or problems with one of my items, let me know ! 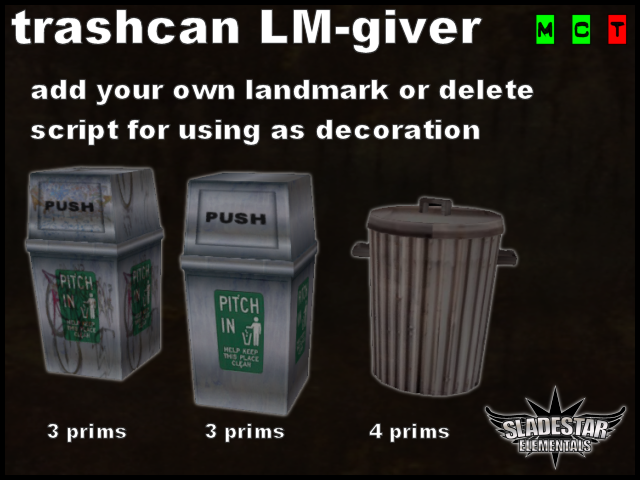 Here you find trashcan landmark-givers – perfect for urban / wasteland – areas. You get two types, one of them in a clean or dirty version. This trashcans need 3 or 4 prims and you can delete the included Landmark and put in your own. For greater areas i had made it full copy for you. Any problems with one of my items or you need some help using it ? Let me know ! 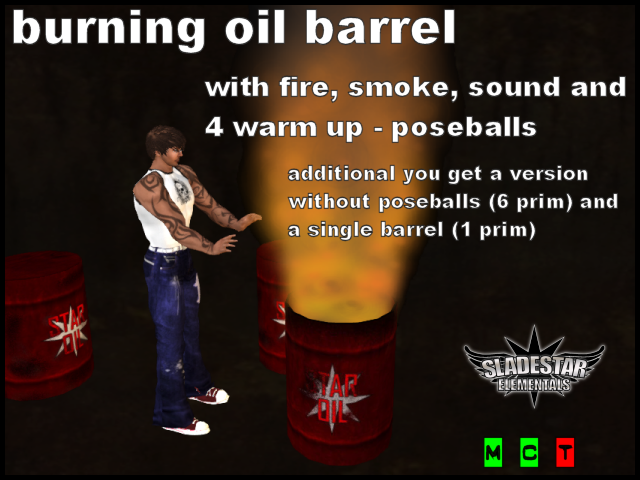 Here you can get a burning oil barrel with particle flames, particle smoke, sound and 4 warm up – poseballs. It’s perfect for urban and wasteland styled areas or for neko and hobo use. Additional you get a single barrel to decorate around your burning version. If you want the flamin barrel for decoration only, you get a version without poseballs inside, too. All included items are full copy, rezz as much as you want or need. You get modify too (scripts not) to make some changes if you want. The complete barrel needs 10 prims, the version without poseballs need only 6. The single barrel has 1 prim. If you have problems with it, or need some help by using, let me know. 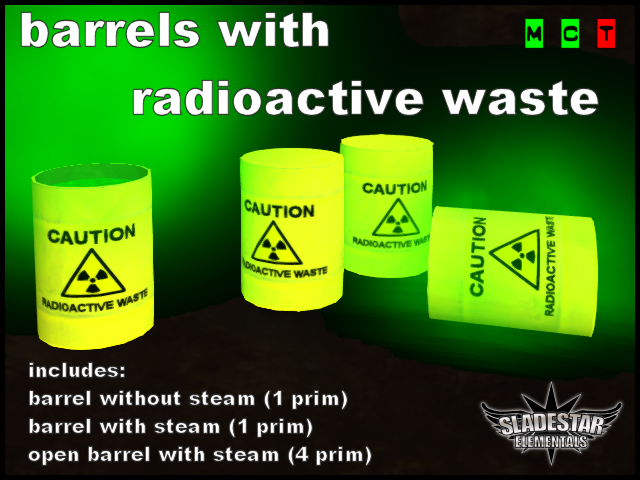 Get some barrels with radioactive waste for your urban, wasteland or apocalyptic area. The first type is a “normal” textured barrel (1 prim), the second type seems to have a whole, it steams radioactive (1 prim). The third type was open and the green radioactive liquid inside steams stronger (4 prims). All barrels are full copy – rezz as much as you need. Any questions or problems with one of my products ? Let me know !